I have owned my 1982 Kawasaki GPz1100B2 for a few years now and its been the most reliable bike I have ever owned, its done Phillip Island runs (4500klm), attended numerous motorcycle rally’s all over the east coast of Australia and functioned well as a daily commuter while not letting me down once. Now in its final stages of completion, the body work is in getting a profession paint job, the base coat of Eddie Lawson Green is down and this week the decals should be going on along with paint and clear. In August 2011 I decided to overhaul it starting with a frame straightening by Dave Kellet, fitted new wheel and swingarm bearings, cleaned up all of the alloy components, re-paint/powder coat all the metal parts and a complete new paint job. The goal is to have a new bike that looks and handles like an Eddie Lawson Replica (ELR) since they are in fact almost the same bike but with different brakes, instrument cluster and different handlebars. The B1 is a much closer match to the ELR as it features 7/8″ handlebars as standard. The B2 strip down starts! In the course of rebuilding the B2 I have finally added the GPz900R calipers and master cylinder and replaced the brake lines. At some point in the future I will make a new rear disk caliper mount kit and get something that stops better! I initially expected the whole process to take 6 to 12 months but due to finances (and I have 3 other bikes on the road) it ended up taking considerably longer! After 7 years in the garage, the B2 is complete (minus the final paint work) and the engine fires up! I temporarily fitted some z650 coils as the leads on the old coils were faulty, so I’m off to the shop today to get some 7mm lead and refit them. The main delay the last few weeks has been crap in the tank, the old fuel plus moisture has led to rust scale build up so I have been flushing it every few days with white vinegar and it done the job nicely. Before detecting this I could not get the engine to fire, so two rounds of stripping the carbs and cleaning out the crap has done the trick. Update: No one sells 7mm leads :(. I ended up getting 8mm leads and paired back the outer insulation and then did a trial fit into the original coils but with NEW NGK plug tops, looks great! Update: Body parts and tank dropped into paint shop for a new paint jobs. I need to make a bracket to hold the fuse holder and then get all the brackets powder coated. I made a bracket to hold the GPS for the trip in March next year (and to verify the speedo calibration), it also needs to be powder coated once I finish it off. I have also sourced a manufacturer of the bikini fairing and s.
The B2’s running frame is complete and I need to do a once over and check every bolt to ensure bits don’t fall off for its maiden ride and registration. I also need to remove the cam cover and check the shims and oil, there is at least 1 shim that is wrong as I can hear the tap from it. If its covered in oil then I can tick off the oil pump assembly and so the engine should be good to go. Stripped bike ready to get straightened – it appears to have been in a head on crash at some point prior to my purchase of it as the frame head stem is bent back by 1 degree, which explains why it handles so well, it has quicker steering!. As the bike is used for touring I need to get some new solid mounts for the gear sack rack on the rear fabricated and welded in and two mounting plates onto the front down tubes to stiffen the frame where the head on smash occurred. While my frame is in the workshop a genuine ELR arrived and its “totaled” from a smash so I snapped some photos of the paint work so I can get everything perfect. 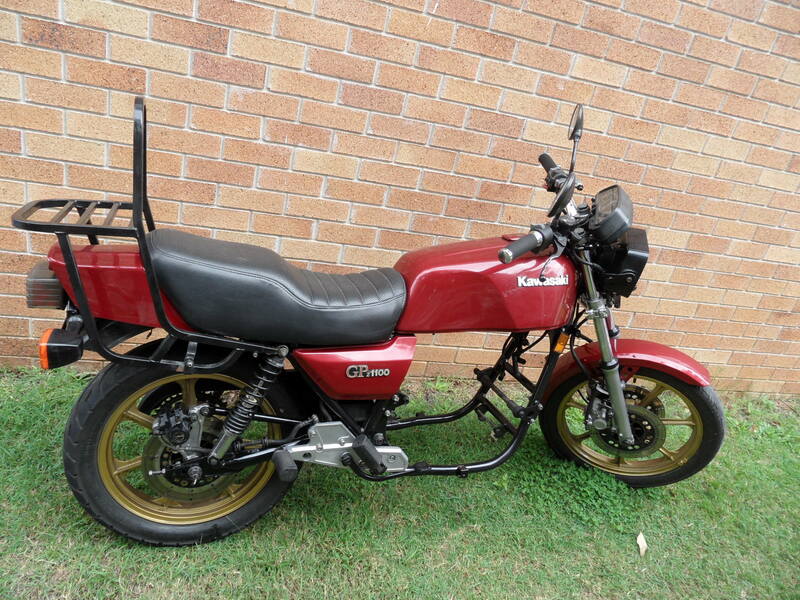 It also confirms my statements on other forums that the ELR is based on the GPz1100 as the frames are almost identical! It looks a mess but there is some order to the parts on the floor! 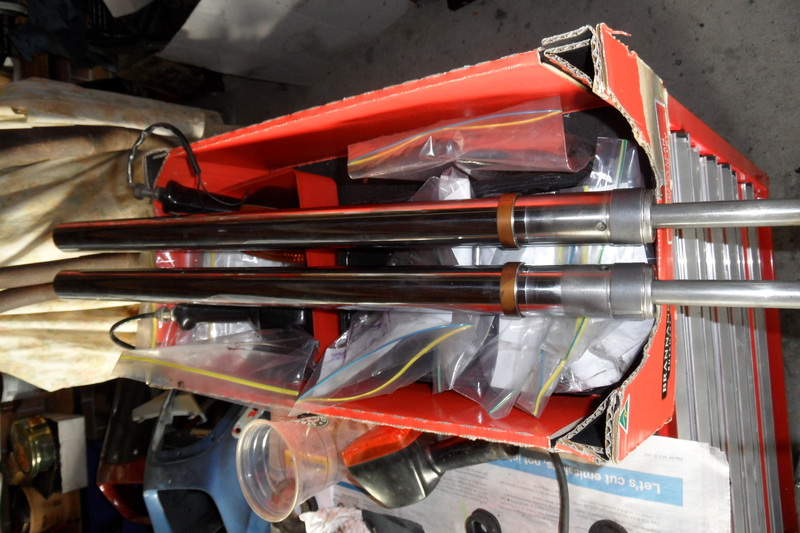 While the frame is in getting work done I used the time to send parts in for powder coating and start to get some of the alloy parts cleaned by Wayne Jacobson at Specialized Blasting Services near Jimboomba in Queensland. The engine Gasket set has also arrives along with a few odds and ends for the calipers. 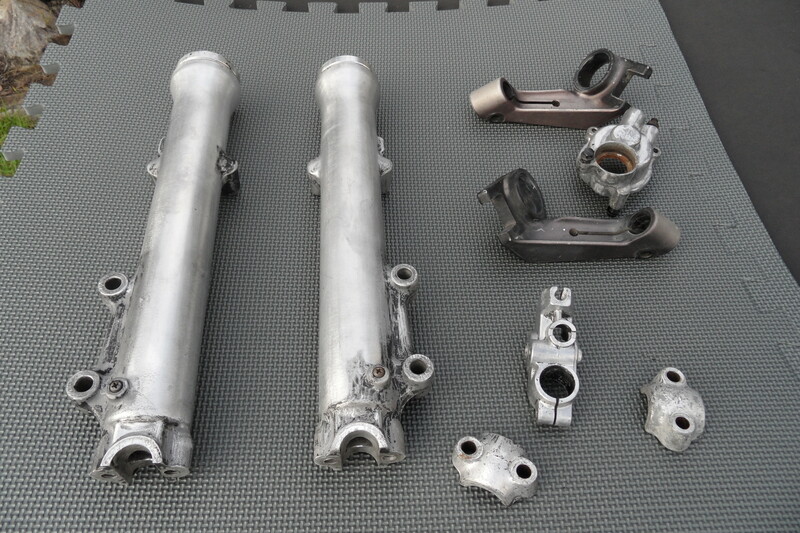 Paint stripped and ready to get water blasted clean (the observant will also spot the GPz900R thermostat housing). Restoration work has begun, bike has been fully stripped and the frame sent for straightening and returned, Everything is trued and straight. All metal parts are now powder coated and the bike is ready for reassembly. As the forks where leaking fluid past the seals, I decided to get the forks hardchromed and rebuilt at RAD Hardchroming. I will start the engine strip down and clean when I have rolling frame done. Frame re-assembly in progress, fabricating custom fasteners (cut to correct length) and assembling as many parts as I can to achieve rolling chassis. Some parts will be renewed in time. Need new front tyre. Wheel rims painted gold earlier in the year and new bearings fitted at the same time so they can just bolt on for the time being. 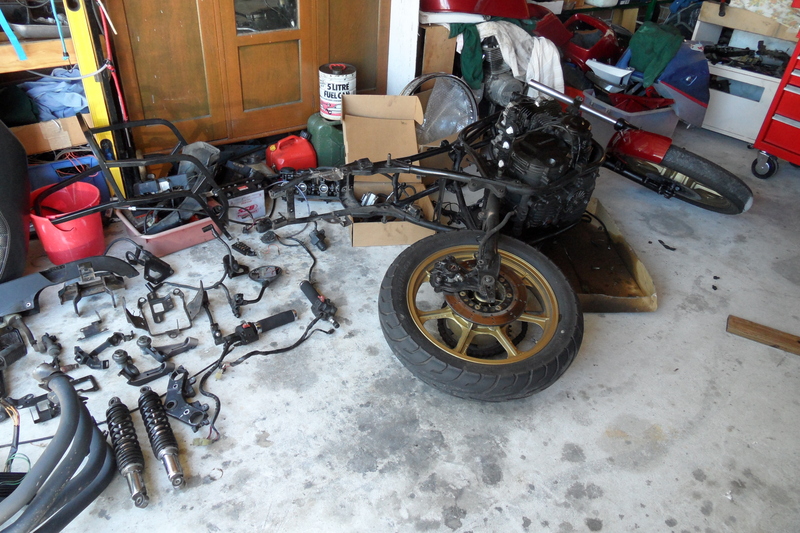 Swingarm bearings and rear end assembled, ready for rear wheel. 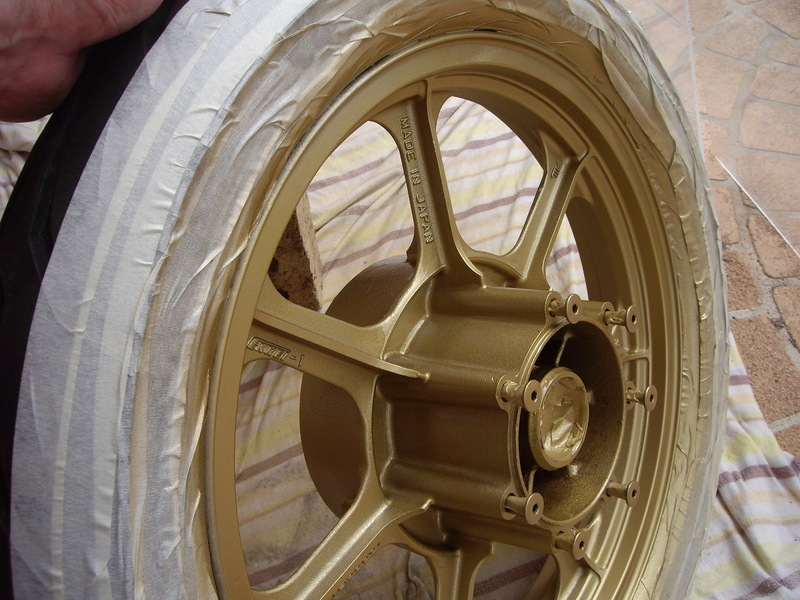 Gold paint done, will eventually redo the paint when I can locate a powder coat that matches and can do the job without ruining the alloy polish on the side of the rims. Using the Gurnie I remove the remaining paint from the tank. The tank has sat in Molasses for two weeks. With a little work the tank is bare of paint! I used the B1 tank to develop my skills in painting before I touch the B2 tank. The front guard is primed with etch primer, next to do is the tank, but first the old body filler must come out and the dents repaired or refilled. Bare tank with bog showing and primed front fender ready for colour. Side covers and duck tail undergo initial painting in ELR green base colour. My initial experiments in the body work show that there is a lot of work needed to finish the tank before the base paint can be applied. 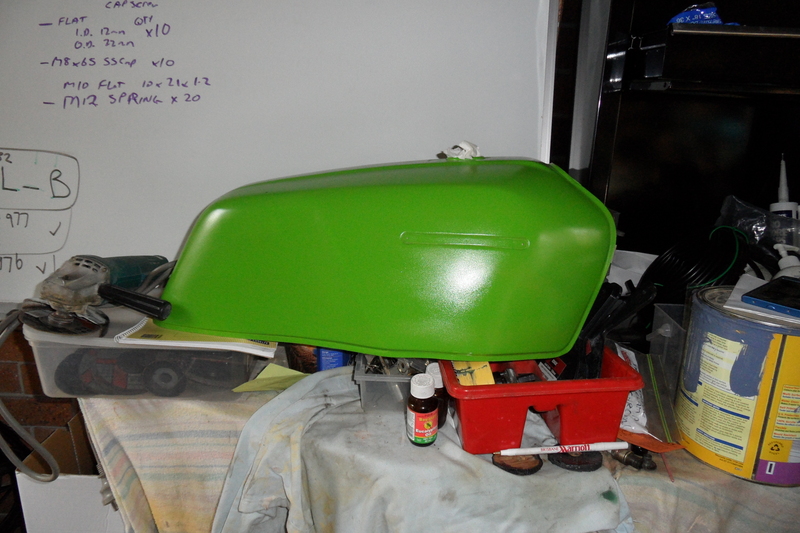 Side covers and duck tail are done in the base paint colour. Front guard is still in etch primer, next object to get solid colour. I also need to start prepping the side covers and tail section for Blue and White strips over the green base colour. B1 Tank with base colour down but in need of some 800+ Wet and Dry sanding. Interesting side note: Found an article from a Kawasaki dealer about front sprocket bolt coming off on its own. This caused the first factory recall for Kawasaki. There is a kit that prevents this so I will look into this and make sure I do something to stop a repeat occurrence after my front sprocket came off after a rear wheel change. Prior to taking the bike off the road the forks were leaking oil and blowing seals to often as a result of small pits. So I disassembled the forks and took them to RAD suspension to get the hardchrome machined off and the forks recoated, they also replaced the bush at the top and bottom of both legs as they were worn. Frame re-assembly is now completed and the rolling frame has all the bits assembled, just needs some wiring harness repairs, headlight installed, fairing fitted and engine installed with all the bits to make it go. The picture below includes the modified front calipers from the GPz900R and I put the original B2 bodywork back on for the time being. 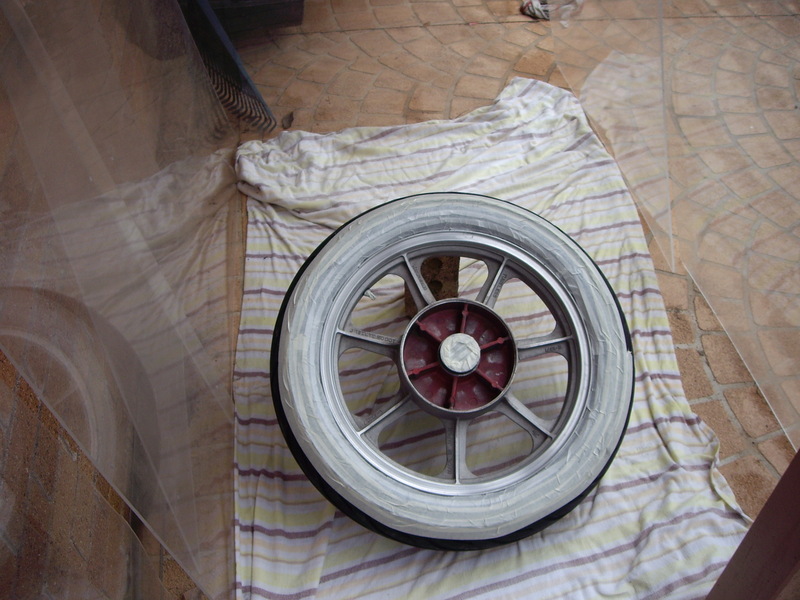 I have learnt to appreciate the amount of work spray painting requires prior to putting down paint so I will take the body parts into Budda’s Motorcycle Paint and get him to have a crack at it. If its good, I’ll get the burgundy/red set done also. The partially complete rolling frame, I’ve kept the gear sack carrier on the back as I like to use this bike to tour on. I started to strip paint off the engine starting at the cam cover and decided it would be better to get it removed by a commercial Soda Blaster. To make it easier to transport I strapped it to a pallet and took it over in the ute. Below is a “BEFORE” picture of the engine, when it comes back I will take an “AFTER” soda blasting picture then strip it down and take the alloy components over to Wayne at Specialized Blasting Services to get those parts water blasted back to new. After that its just a reassembly with new gaskets, seals and a new cam chain. Ready to get soda blasted (BEFORE shot). After much procrastination and waiting for my shoulder to heal up after keyhole surgery I finally spent a day stripping the engine down. Getting it soda blasted clean was a great idea, it was so easy to disassemble and separate. The engine reassembly required every piece to be professionally cleaned first. After it’s completed the result has been an better than expected resulting in an almost new engine siting on the bench. The head has been repaired where the cam holder bolt snapped. and the head stripped and sent off to get professionally cleaned. The Engine is now almost fully re-assembled. Its been a long haul with the GPz1100 neglected for a while due to other bikes but I purchased rings for the Wisco Pistons. 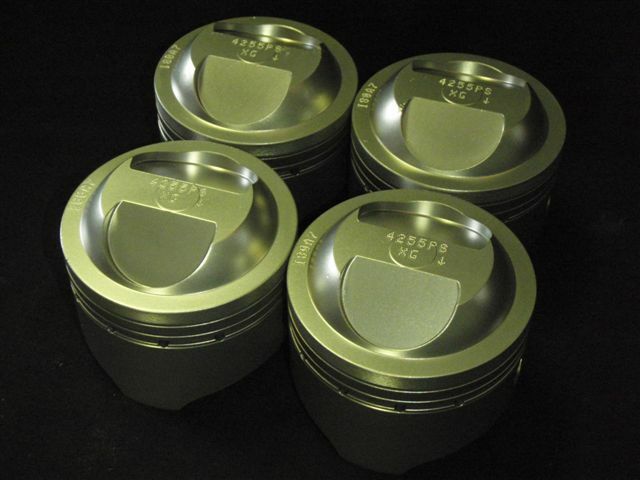 I have had the pistons cleaned up and the head is next on the list, its in the shop now and should be ready first week of February. 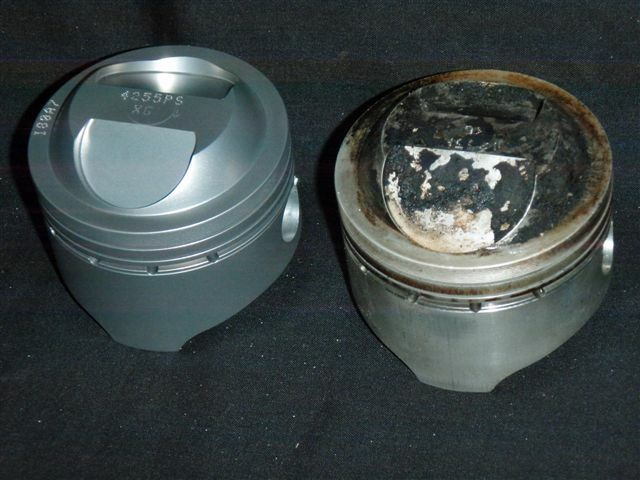 On the left the freshly cleaned piston, the right is about to get done. All four done and in perfect condition ready to install. Now to hone some barrels, fit the pistons and complete the engine assembly ready for installation into the frame. Although I have 2 GPz1100A1’s I don’t have them in the garage to verify, but from memory they run similar if not the same calipers and master cylinder as the GPz900R ‘s. The B2 runs a very early style caliper and master cylinder that is very sub-standard. I suspect the A1 model was the experimental change which worked very well and was then used on the 900R onwards. To fit them to a B2 I had a friend machine up spacers so the caliper sat central to the B2’s disks, it was around 8mm from memory I will have to get the verniers out and measure it exactly. The braking is now substantially better. The GPz900R master cylinder design is almost identical to my 1994 zx900R so the design has proved itself over the years. Hi Sid, im cracking on with my b2, while im waiting for the frame and swing arm back from the straightener, I thought id have a go at the caliper mod as I have some early gpz900 calipers. Ive measured up and it looks like I need a ~ 12 mm spacer to centralise the caliper on the disk but the caliper bracket doesnt hold the caliper far enough out from the fork leg to fit to the edge of the disk, I notice that the gpz1100a caliper mount holds it out further but I dont know if its enough. have you any close up pics of the calipers on or off the bike so I can see where im going wrong? I think I used the standard caliper mounting brackets from the GPz900 but I’m not sure which model, they should all be the same, I also think the spacers were only 8mm but I will check it over the week and get back to you with some dimensions and pictures. Are you sure the engine is “Defunct”? Best bet is eBay and maybe buying a doner bike? A Little comment from a country far far away, Sweden. I’m in the finishing of a total rebuilt of a B1 down to the correct marks of the nuts and bolts. The downer bike Will later be a ELR. Good to read about your work. Like to post a Picture of my bike to You. But don’t know how to add to this mail. I am looking for a gearsack rack for GPz750 like yours pictured. Would yo have one for sale or know hoe=w yo can help me please. No idea where I got it from, try eBay, I might have bought it 10 years ago as it fits almost all bikes.